Construction, traffic noise, and airplanes flying overhead: Noise pollution the world over lessens quality of life and brings ugliness to what would otherwise be beautiful urban landscapes. To add to this cacophony of sounds are street performers—musicians, actors, artists—all trying to work their trade in the midst of the hustle and bustle of cities the world over. To fix this problem, one Israeli has come up with an ingenious solution. Called "mini-amphitheatres," they are aesthetically-pleasing, sidewalk-size-appropriate amphitheatres, which can be used not only to block out unpleasant street noises, but also to provide a venue for buskers to perform, increasing the cultural landscape of a city. "I sought to determine which sounds were more pleasant for people and which were more grating—what caused people to want to be in an area, and what caused them to want to leave. Something that I discovered is that noise pollution is just as effective at deterring people from being in an area as is physical pollution," she said. 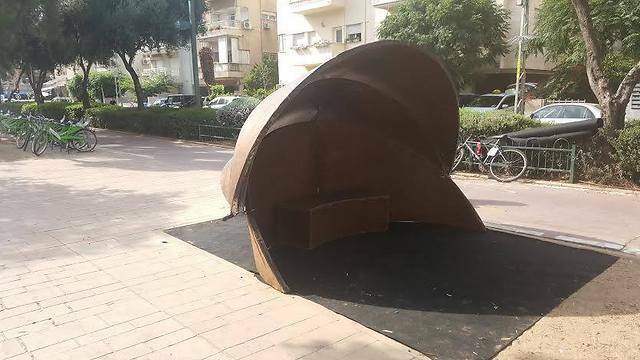 Standing on the corner of Ben Gurion Boulevard and Dizengoff Street in Tel Aviv, she used a decibel reader to determine whence the loudest sounds on the street were coming and what was causing them. 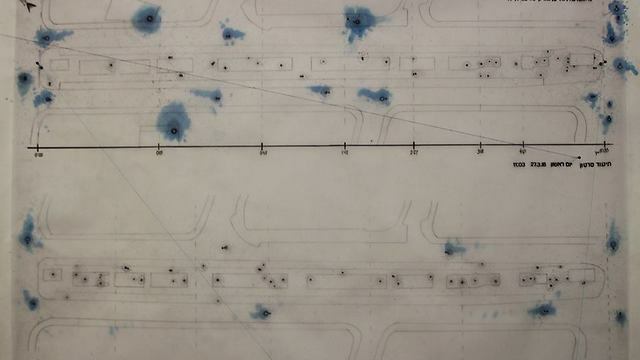 She mapped these areas out and used her maps to determine the best way to mitigate these sounds. That’s how she came up with the idea for the mini-amphitheatre. "I wanted to find a way to reduce noise pollution, while at the same time adding pleasant sounds to the surrounding area." The mini-amphitheatre is able to direct the sounds of the people who are performing in it—whether they be buskers performing musical instruments or street actors giving a performance—to an audience without disturbing the other people living or walking in the surrounding area. "Sound naturally goes up, so by performing inside of these mini-amphitheaters, the sound is able to be directed towards an audience more fully. This also eliminates the need for speakers, as the sound is naturally amplified." To design the structure, Even spoke to street performers to determine their needs, thereby creating the ideal size and depth of the shell so that it would be not only comfortable for the buskers to perform in, but also disrupt the surrounding foot traffic as little as possible. 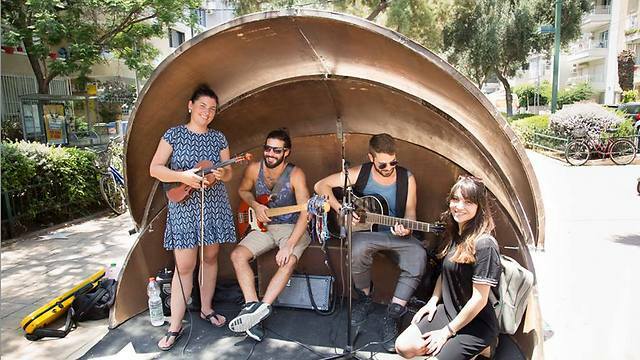 Even has already sold one of her portable mini-amphitheatres, but she hopes that in the near future the city of Tel Aviv and other cities around the world will use her design to not only beautify their cities visually, but also provide a way to mitigate noise pollution and increase positive vibrations. CHICAGO — What makes a product truly innovative? Depends whom you ask. 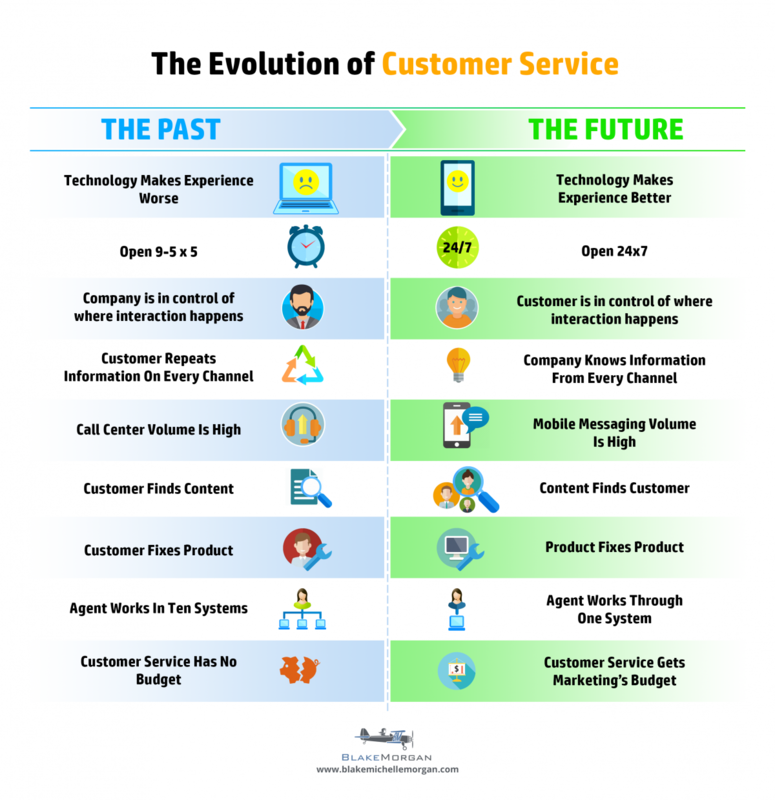 And, as it turns out, the industry and the consumer have differing views. The topic was discussed by industry analysts during the Institute of Food Technologists’ annual meeting and food exposition, held July 16-19 in Chicago. Researchers at Mintel, Chicago, use proprietary survey methodology to collect consumer input on every reported food and beverage product launched in the United States each year. The analysts identified five innovative products debuting this year and measured consumer reactions and purchase intent of those products. One product was Labni Mediterranean Kefir Yogurt Snack from Los Angeles-based Kronfli Bros. Varieties include mint and garlic, lavender and honey, and sundried tomato and basil. Mintel analysts predicted the product would bring a unique twist to the crowded yogurt category; however, consumer feedback indicated reluctance to experiment with unusual flavors or an unfamiliar product concept, especially if the product is relatively pricey. Only 24% of consumers surveyed by Mintel said they would buy Labni, compared to 41% of consumers who said they would buy any spoonable yogurt. Labni may eventually catch on; consumers just may be slow to adopt it, said Lynn Dornblaser, director of innovation and insight at Mintel. Another recently launched product Mintel identified as innovative was 1893 From the Makers of Pepsi-Cola Ginger Cola, which was inspired by the brand’s original recipe. One of Mintel’s picks that rated favorably among consumers was Kraft salad dressing in two-serving pouches from the Kraft Heinz Co. Varieties include zesty lime, golden Italian, classic ranch, lite balsamic and chipotle mango. “This salad dressing outperforms the category by a significant margin,” Ms. Dornblaser said. Forty-six per cent of consumers said they would buy the product, compared with 38% of consumers who said they would buy any salad dressing. Here’s why it’s a hit: The brand is recognizable, the flavor varieties are familiar, and 60% of consumers rated the product format as convenient, twice that of all dressings. “This is a case of the brand and flavor and purpose and communication all coming together and communicating very well to consumers what this product is all about and hit the needs consumers have,” Ms. Dornblaser said. So, what products do consumers consider innovative and exciting? Top picks introduced this year include Sargento Tomato & Basil Jack sliced cheese, Ghirardelli Dark Chocolate Premium Brownie Mix, and Nestle Dreyer’s Slow Churned California Caramel Almond Crunch Light ice cream. Consumers’ top choices were almost all indulgent treats from established brand names, and most were repackages, restages or reformulations. Based on these findings, Mintel identified a couple more recent launches featuring these attributes. Ben & Jerry’s new line of non-dairy frozen desserts marries the trend of dairy alternatives with the strength of the brand name, combining indulgence and perceived healthfulness associated with vegan and non-dairy products. Consumer purchase intent of the products was higher than that of other frozen desserts, including dairy-based ice creams, Ms. Dornblaser said. Another new product expected to resonate with consumers is Oreo Thins cookies, which Ms. Dornblaser described as the “perfect combination of new and familiar.” Oreo Thins, which is a crispier version of the popular sandwich cookie, was rated by consumers as the most exciting cookie launch since January, and the purchase intent of the product was almost twice that of all cookies, Mintel research found. Additionally, because Oreo Thins were found to be more likely an additional category purchase than other cookies demonstrates the potential to grow the entire cookie market, Ms. Dornblaser noted. “This illustrates the power in innovation being something familiar, plus something that’s just a little bit different,” she said. “You can think about innovation in two ways — close-in innovation and longer-term innovation. Close-in innovation is all about that flavor, new package, shift in functionality. Those scored the highest among consumers. It’s something familiar with a twist, like Oreo Thins. Norway is contemplating some futuristic road projects. Fjords are beautiful for sure, and Norway is basically nothing but fjords. But for those wanting to get from point A to point B with a fjord or two or seven in the way, they can be quite irksome, referring drivers to ferries. This represents an enormous infrastructural problem for Norway, and the Norwegian parliament has decided that the E39 highway shall become ferry-free. Bridges and tunnels - Norway already has many of them - wont always do the trick. Sometimes a gap is too deep for a tunnel to be a plausible solution, or too wide for a bridge - refering drivers to ferries. Luckily, there is a new solution. In a feasibility study, the Norwegian Public Roads Administration presents designs for the world's first submerged floating tunnels, that, if implemented, will let cars pass underneath the surface of fjords without hindering the entrance of ships. The design features to antiparallel tubes floating with the help of pontoons and Archimedes' principle. Each tube will be big enough for two driving lanes. The pontoons are spaced far enough apart to allow big ships to pass in between. The Norwegian Public Roads Administration is simultaneously looking at other possible solutions, like floating bridges, or a combination of a floating bridge and a submerged floating tunnel. The submerged tunnel project is not the first of its kind to be proposed, but if Norway goes forward with the plans it will be the first time the concept is put to test in reality. And if it proves a success it could open up for similar solutions all over the world. One submerged tunnel that has long been suggested is a transatlantic highway connecting Europe with America through Iceland. THE UK ISN’T WINNING any awards this week for its collaboration skills, but the country deserves some credit for “Months,” one of five installations in the British Pavilion’s “Home Economics” exhibition at this year’s Venice Architecture Biennale. Here, if not in the European Union, Britain presents a new model for shared living spaces. “Months” proposes a monthly rent that includes not only the use of real estate, but all domestic needs—things like cleaning, cooking, laundry, maintenance, and wifi. “We’re interested in making communal living easy and affordable,”says Pier Vittorio Aureli, a partner at Dogma, the Brussels architecture firm behind the installation. (The words “A home without housework” appear on the frame of the doorway leading to the installation.) At the center of the room is a private, blue-paneled, two-story “core.” It’s designed for sleeping, washing, and occasional cooking. The surrounding double-height zones—which make up the majority of the room — become shared spaces for working and socializing. The idea is that residents share services as well as spaces. The installation takes up one of five inter-connected rooms inside the British Pavilion’s austere Venetian palazzo. Aureli says the plan was inspired by the boarding house, a once prevalent model in the U.S. that was replaced after World War II with the rise of suburban living. He adds that boarding houses like New York’s Chelsea Hotel once did exactly that, but took on a stigma as being unfit for family living. Properties modeled after “Months” could rise on unused lots away from city centers, near mass transit. Aureli and his team envision cities using tax incentives to encourage developers to create housing in these zones, rather than using them for commercial purposes. Like “Months,” the other four installations in the “Home Economics” exhibition are named for, and designed around, increments of time. “Hours,” for instance, envisions what a shared home environment would look like, if it one lived there for no more than a few hours at a time. It is filled with simple objects whose forms (modular daybeds) and functions (shared wardrobes) are transitory in nature. The “Days” exhibit explores the potential of portability, proposing strange new types of personal spaces—two inflatable, wifi-connected spheres that can you can climb inside and roll around to new environments. It suggests that you really can live anywhere, as long as you can get online. “Years,” the least architectural installation of the bunch, is a shell construction that imagines a home built for profiteering, not living; it contains only those things necessary to qualify for a mortgage: a roof, running water, electricity, a lavatory, and a basin—and spartan examples of each, at that. The masterminds behind “Decades,” London architecture firm Hesselbrand, oversaw construction and design of each installation. “Our goal was to make immersive environments to explain an idea,” says Hesselbrand cofounder Magnus Casselbrant, pointing out how space—rather than lots of complex text—can speak for itself. And while the collaborative spaces all evoke our omnipresent sharing economy in their own way, don’t call them derivative of Airbnb. Aureli says he prefers to think of “Months” as an idealistic experiment in communal living, not a get-rich scheme. “Sharing economy is a buzzword that becomes a way to make more money out of everything,” he notes. But after the Brexit fallout, Brits might consider all the money-making options they can get. Physical Therapy is in an exciting place as it is truly a value option in health care. For certain conditions, PT is more effective than surgery and other interventions that cost more money. Patients need the greatest quality care at the lowest cost, the value option. Also, PT is a non-pharmacological intervention and thus appeals to patients who are wary of drug side-effects. Clearly, PT is an effective low cost option to treating musculoskeletal injuries, which is why more people are gravitating to the physical therapy field. It's a perfect storm and everything is aligning in favor of physical therapy. We have several. We started innovating physical therapy in the education sphere through the development of our dual degree programs. For example, we have a DPT/MBA and DPT/MPH, and we have recently developed a DPT/PhD program with the our local engineering school, Georgia Institute of Technology. The latter program offers a pathway for collaboration between engineers who don't have clinical background, who look forward to collaborating with clinicians. In addition, we started offering interdisciplinary electives: Interfacing engineering technology and rehabilitation, which brings together engineering, neuroscience, and DPT students from different backgrounds to look at patient problems and work together to solve these problems from a number of perspectives. Beyond just mixing engineering students and DPT students, we are also offering a business elective course: Business Management for the Physical Therapist Entrepreneur is an advanced business course that uses Harvard Business School case studies -- Toyota, Starbucks, Callaway Golf Company, and Apple -- to teach physical therapy students how to improve efficiencies within health care. Essentially, we are teaching physical therapists to become innovative by asking: What can we borrow from other industries to innovate the physical therapy field? For example, can DPTs apply Starbucks' customer service and marketing expertise to the physical therapy field? Or, apply Toyota's operations expertise to physical therapy? Or, learn how to develop an emotional brand experience, like Apple. Students really love it and it is totally out of the box. Dr. Zoher Kapasi: First, we must recognize health care is a business and there's nothing wrong with that-it helps us deliver services. There's no mission without a margin. The Red Cross has to bring in more money than it spends to provide services to needy people around the world. And - we need those business skills. We teach great skills in manual therapy etc, but if we don't show them how to market themselves, we're not doing a great job as educators. And, ultimately, we're doing a great disservice to our consumers. I tell my students: If you went to a town and saw everyone limping and walking around crooked, wouldn't you want to tell everyone you can help them? What's the shame about that? Everyone wants to help people, but if people don't know you can help, you won't be able to help them. In healthcare, clinicians feel that marketing is beneath us, but it's time to show why we're the best kept secret in health care and no longer keep that as a secret. Lauren Jarmusz, sDPT: The general public doesn't understand that PTs are not just massage therapist, and that PTs take med. school classes, like anatomy. How can we create a more positive image around the role of a Physical Therapist to laypeople? Marquis Cabrera: According to IBIS, there's no major player in the physical therapy field across the country. Why do you think that is? Dr. Zoher Kapasi: Many years ago, I did some research on the physical therapy marketplace. I found that there were four or five majors players, like US Physical Therapy, Physiotherapy Associates etc, that control 15% of the market, but 85% is controlled by the "mom and pop" clinics and thus, the physical therapy services industry is fragmented. To me, physical therapy has always been about the solo practitioner because the field is very relational, interacting with people. With healthcare reform, a lot of consolidation is occurring, and economies of scale are beginning to occur, - big industries provide the services and hopefully, you can reduce the cost and get better outcomes- but I am not sure how much of it will occur in physical therapy field because patients want a clinician to relate to. We like to have our own relationships. Some companies, however, are building relationships with scalable business models. Starbucks is a prime example. If however, PT becomes more capital intensive or forward integration occurs from hospitals to ensure better outcomes for post surgical patients, consolidation may happen quickly. Consolidation is not always bad, let me draw from another industry - airlines: If every pilot started their own airline company, we would still be flying two engine planes. However, by forming big corporations, airline companies have consolidated to afford big jets that allow us to travel in planes that are faster, safer and at a lower cost. In physical therapy though, we don't need that much capital and thus we can easily start our own practice, which is why our field is fragmented. Lauren Jarmusz, sDPT: Research shows that PTs can act as primary doctors. I know the APTA is advocating for direct access to PTs without a physician's referral. What do you think of the move towards preventative based care versus reactive care in the Physical Therapy space? Dr. Zoher Kapasi: This is already happening abroad. For example, Aussies are very active and outdoorsy. I have a faculty member from Australia. She told me: "Each person in Australia has their own Physio (Physical Therapists are called Physiotherapist or Physios in Australia, UK, India etc), like we have our own primary care physicians (PCPs) in the US. Australians are super active, so many go for check-ups to look at flexibility and muscle strength at times before they embark on a major sporting activity. We have to show people the value of preventative-based care in the US. Baby boomers are prone for more musculoskeletal injuries, for they are still active, and could benefit from preventative based musculoskeletal health, especially because they are looking for things to help them stay active. "If exercise was a drug, it would be the most prescribed drug in the industry". As a future Doctor of Physical Therapy, you must capture the value of prevention and find a way to get paid for it though. Many people are paying for a lot of money up front for preventative-based musculoskeletal health care. There's some innovative practices where folks are getting into prevention and getting money out of it, especially since potential clients can now pay directly out of health savings accounts for preventative-based health care. Dr. Zoher Kapasi: Yes, they should be primary care providers for musculoskeletal care. If you get low back pain, you should go straight to your physical therapist. As it stands now: If you have lower back pain, you get painkillers from your PCP. If you don't get better, PCP refers you to an orthopedic specialist. Unless surgery is needed, the orthopedic specialist is going to refer you to the physical therapist; then you just wasted time and money, especially on tests, MRIs etc. PTs are trained that if something serious is taking place with a specific patient, we can refer to surgeons or other experts as necessary, but in other cases they can get started with care in a much better way. At the Virginia Mason Medical Center, patients with low back pain can go directly to PTs, and they have seen tremendous cost savings. Dr. Zoher Kapasi: Yes, annually physical exams would help with educating patients. I don't think people prepare for activities and thus may lead to injuries. Proper lifting techniques, core strengthening exercises could all help in prevention of lower back pain. Anyone can use a search engine like Google to locate the nearest seafood restaurant, or the best school in their neighborhood. But medical researchers don't have an easy way to type in questions and receive meaningful answers. Andy Conrad, who heads up Verily—formerly known as Google Life Sciences—is working with a coalition of academic hospitals, physicians, universities, and patient advocates to bring medical information into one place. He calls it the "Google of human systems biology." "Unfortunately, most of the information that scientists use isn’t easily available," Conrad said on stage at the Future of Genomic Medicine conference in San Diego on Thursday. "That information sits around in difficult-to-crack domains." Conrad didn't provide many specific details on how the product would work. But he did say that it would involve a library of sorts that leverages machine-learning technology. "It doesn't work as wonderfully as a human," he says. "But it can answer questions." He confirmed a rumor that Verily's team is working out of a 500,000-square-foot campus in South San Francisco, just a stone's throw from Alphabet's corporate headquarters. The size of the workforce remains unknown, but Conrad said he is adding 1,000 people in the coming months. Indexing the world's medical information isn't a particularly new idea. IBM Watson and other tech behemoths are developing artificial intelligence technologies to do just that. But Conrad, who previously worked at Google's research and development lab Google X, implied that Verily is taking a more human-centered approach. Medicine is as much an art as a science, so Verily is working with patient advocates, mothers, and doctors to determine how to aggregate data that can't be found in scientific journals. As an example, Conrad said he recently spoke with a high-profile doctor who used loosely veiled code like "TLS" ('they look sick') to describe his patients. These notes might mean a lot to an individual doctor, but they mean very little to anyone else. "How would you capture that in an algorithm?" This isn't Google's first foray into health care. The ill-fated Google Health shut down in 2011 after it failed to gain traction with consumers. But Conrad said he has learned from previous failures. "In our early forays into health care, we had a bunch of engineers that might not be wonderfully in touch with the rest of the world, especially at Google," he recalled. "But the most interesting thing we did then was to gut an office and turn it into this sequencing lab filled with physicists." "People often ask me about the future of medicine," he said. "We think the most important tool is the computer."